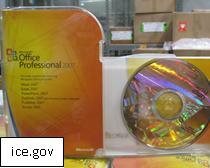 On October 16, 2012, the Immigration and Customs Enforcement (ICE) announced that a man in Lakewood, California surrendered to authorities and started serving his 3-year sentence after he imported over 1,000 counterfeit Microsoft Office CD-ROMs and sold them over the internet. The defendant’s name is Collier Bennett Harper, and he was sentenced on September 24, 2012 on 21 different counts of trafficking counterfeit goods. The U.S. District Judge, John F. Walter, also ordered Walter to pay restitution of $370,000. The ICE’s Homeland Security Investigations (HSI) led the investigation into the counterfeit software. HSI seized two shipments of the 2007 Microsoft Office Professional Edition software that were then traced to Harper. Furthermore, the investigation later found that Harper would ask well known dealers on eBay to sell the counterfeit software. He told the dealers to list the software as “new” and “authentic” when it was actually counterfeit. After the dealers found a buyer, they would provide Harper with the buyer’s home address and form of payment, and Harper would send the software himself. It is believed he sold about 1,000 pieces of software. The restitution was calculated by using the manufacturer’s price for genuine, non-counterfeit software. The software that was seized would have sold for about $370,000. This latest arrest and sentence is only one of the latest efforts from HSI to stop the sale of counterfeit goods in the United States. Other recent arrests have related to counterfeit airbags and expensive merchandise.